First of all, I am new here and have read some of the posts already about similar issues but none of them describe my situation exactly so I am just going to ask and see what happens. Bought this LX50 today. Seemingly great condition, 772 miles and is a 2008. The girl I bought it from had taken it to a shop where I eventually picked it up. Just had an oil change, new air filter, cleaned out the fuel lines as it has been sitting a while. Fresh 91 octane which is the highest we can get here. I called the shop where it was and asked the guys opinion of the scooter and he said that he wanted to buy it from either of us so I figured I am in good shape. Picked up the scooter today to drive back to Boulder. I noticed when I first drove away that it bogged a bit at full throttle. I didn't think much of it as it was about 30 degrees out and not warmed up. 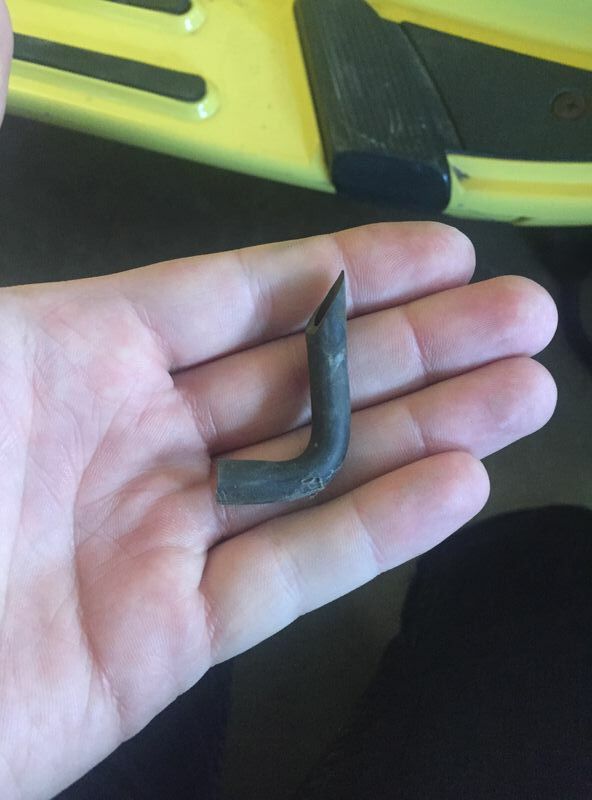 The mechanic told me that it would likely not go much faster than 30mph. So I drove away on a slight downhill and got to about 32 mph. The top speed of my ride. The speed slowly starts to get lower and if I go anywhere near full throttle, it bogs and begins to slow even more. I could coax it to hold about 26 mph. Again, didn't think much of it as there was a headwind, cold, etc. I stop at a gas station to top it off about 12 miles in and it will not start after that. I sit there and try for the next 10 minutes or so and nothing. I call the mechanic seeing if there is anything he would recommend and sure enough, as soon as he answers the phone, it fires right up like there was no issue. I continue my drive home, only another 1.5 miles or so home, and it dies on the way into the garage. I begin my dive into the internet and see that this scooter is capable of 35-40 mph and notice that my 26 is a fair bit off that. I waited about 30 minutes and go down to check vacuum lines, as I have read about, they seem fine and it fires right up. Roll it outside and go full throttle immediately and from 0-12mph with no issue then wont go much more than that and I can feel it bog down. I take it out and can slowly apply the throttle and get it up to about 22mph but that is it. Do you know if it’s a 2 stroke or 4 stroke? If it’s a 2 stroke clean the carb and jets. Even if this doesn't fix it, it will be an issue eventually. In 30 degree weather the probability of the throttle body icing is there, too. And a 10 year old Vespa with under 1000 miles probably has a really gummed up carb. Most likely your Vespa is speed restricted. In Colorado you can legally ride a 50cc on a car license. 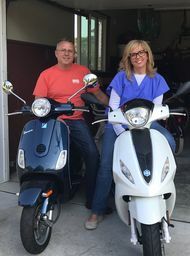 When that scooter was terrifically purchased Colorado law required a max speed of 30mph to qualify as a low power vehicle to ride on a car license and get the $5 for 3 years registration. To go faster you need to derestrict it. FranknBrew gave you the link for the party to derestrict. I would also rclean the jets again. They could have picked up some residual trash from the bottom of the tank or the carb. And make sure the fuel valve is working all the time. Once they get old, they are fairly unreliable. It's easy to do, unplug the line from the carburetor and try to start the bike. If gas comes out, it's working. If gas flows out when you're not trying to start the bike, it's broken, if gas doesn't come out when you try to start the bike, it's broken. Thanks FrankNBrew and all the other responses. So my first step should be to clean the carb, second step would be install the de-restrictor? I will do the fuel line check as well. I know altitude has about a 3% per 1000ft of elevation on non forced induction vehicles. Is there anything carb/jet related that I can do to counteract that? Boulder, CO is about 5600 ft. Doubt it our carburated Derbi 150 would go 67mph in Breckenridge. Our house so is at 10,800 inDenver derestricted should get to at least 40. I have ordered the parts to derestrict the motor to get the 39 mph top speed but they are in the mail and have not installed them yet. I decided to do a little looking around today and noticed that I seem to be missing some sort of vent hose or vac hose on the carb. When I start the scooter, if I cover that hole with my finger, the rpms go up. I have seen a small black hose in other pictures of the top of the engine but do not know where it goes. I was able to find the 90 degree bent hose down in the engine compartment wrapped in spider webs but it looks to have been cut. Is that how it is supposed to be or is it supposed to connect to somewhere else? I have read some more about this issue to no real luck. 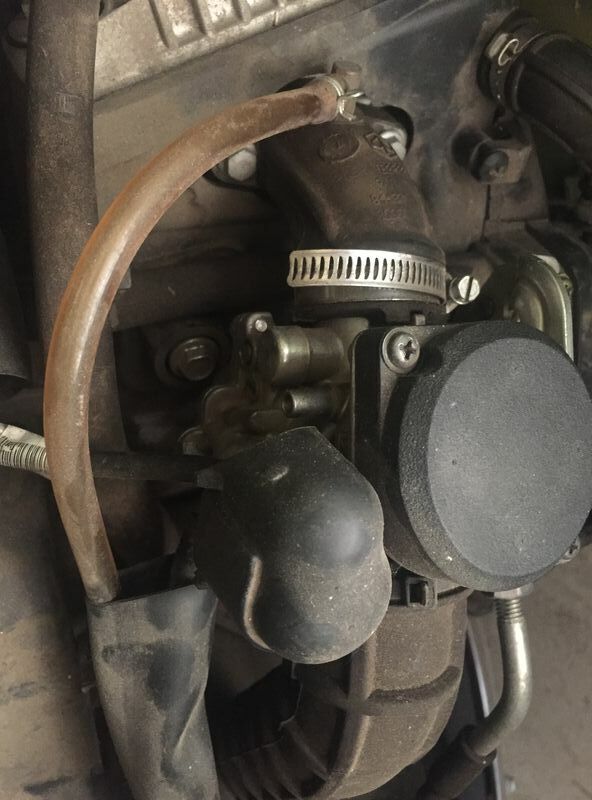 This post (link below) describes my issue almost exactly but there has to be a better solution than just running without the airbox. 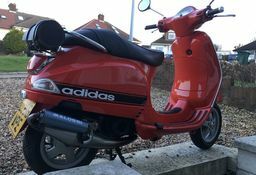 I have a newer, 4-valve, LX 50 that has run perfectly since new with the exception of days over 80 F which are rare where this scooter lives (coastal RI). 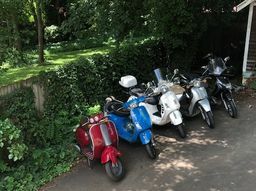 Starting last summer, on the hottest days, the scooter would bog under acceleration, especially just after a hot restart. But once "through" the bog would regain full power. Has never bogged when below 80 F. I read the link and am interested in your diagnostics. I don't know if your scooter was restricted, but derestricted and running properly, it will definitely go 45+ indicated on level roads, 30 up a 4% grade, and hit the rev limiter at just about 50 downhill! Keep us posted. Good luck, running right, you'll be surprised at the power of that tiny motor. That open port on the side of the carburetor is the float bowl vent. It does not need anything attached, although it's recommended to run a line from that port below the engine in case the needle doesn't seat, and fuel starts to pour out of the port over your hot engine. Make sure you closely inspect the intake manifold for cracks. The rubber will get hard over time, and any cracks will cause the engine to run lean and lack power. That vacuum line looks like if you touch it, it will crumble. FrankNBrew - would you suggest anything like in the post that I attached? Seems like a nice filer like that over the stock airbox wouldn't be a bad thing for power's sake and if that manifold cracks overtime ti would solve that issue as well. Still waiting on parts but I really hope the part you suggested fixes this issue. It's no fun to ride the way that it is! Does anyone know the actual answer to this question? Also, I am assuming there is a variator ring installed factory that would also hinder me from top speed but have had no luck with a good description or video of how to remove it. If anyone has this or can provide me with this information, it would be greatly appreciated. Checking if it has the restricted washer on the variator requires removing the CVT cover and looking in the variator to see if it the washer is there. You might have to pull the outer pulley off the variator to see if the ring is there. Be sure to use a torque wrench to tighten the nut back on. While in there check the belt, remember it's 10 years old. With only 700+ miles the rollers should be fine. I would replace all of the hoses to be sure they are new. My neighbor had your symptoms on his LX and the new CDI you ordered fixed it. Keep us posted. Giving the variator a really good cleaning worked wonders on my lx50. I was sceptical but the results were really good. No offense, but how much do you weigh? It is a 50cc scooter. It may have been run flat out since new and paybe even seized a few times, have you checked compression. I agree with other posts about cleaning carb jets again. If it bogs out at full throttle, the main jet may still be plugged. Can you pop the carb out and see what size jet number is in there. They cost pennies so maybe just replace......but would be nice to know what size is in there. Installed the new CDI yesterday. It was only 13 degrees out and snowing but I tried to ride it none the less. Rode it back and forth in the parking garage and it would still bog at full throttle. Had to slowly roll the throttle past anything over half throttle to keep it from bogging. I could also not get it past 20mph. The cold may have had an effect on this as the conditions were very similar to the day I picked it up. 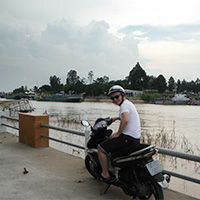 I had ridden it one day the previous week and it was about 45 degrees and it didn't bog then. I did notice that basically nothing happens from a little over half to full throttle, no bog or acceleration. The idle was also not the best once it was hot, lights flickering and motor stuttering a bit. Looks like we won't be above 40 for at least a week in Boulder so I won't get a good long test ride in. I will do the full carb and jet clean next after I can test ride it on a warmer day to see if the weather is having an affect. Check the diaphragm in the carb. If it's not seated right or cracked it can cause problems. To check the carb on the scoot, pull the air box so you can look into the carb. Pull back on the throttle and the Slide should move up. If at full throttle it only raises part way then you have a bad diaphragm. Another way is pull the carb and stick a vacuum cleaner hose on the intake side and open the throttle. Caution be sure all of the gas is out of the carb when you do this. You might also have a dirty main jet if the diaphragm is workin correctly. The CDI was not a waste of money. Your original issue with not starting hot, then eventually starting after 10 minutes sounds exactly like the common CDI issue. Even if the CDI wasn't bad it would have probably gone bad eventually. It still sounds like you're not getting enough fuel. The carb needs a very thorough cleaning. My wife and I weigh a bit more than you and your fiance combined and we regularly ride two up on my LX. I've installed the Malossi 80cc kit, but even prior to that it would easily get up to 30 MPH, and after a half mile at full throttle up to 35 MPH, with 375+ lbs on the seat. You riding alone should have no issues doing the same, and your fiance should be able to zip right up to 35 MPH. The carb was not cleaned at all like the guy said it was. The previous owner had the service done so I really can't go back to him and get anything back out but whatever. I will do the variator ring next and see if I can't get another mph or two.